Sting rays like to rest on sandy bottoms or areas of gravel and rubble, often under a ledge or shelf. The grow quite large, up to six feet wingspan. 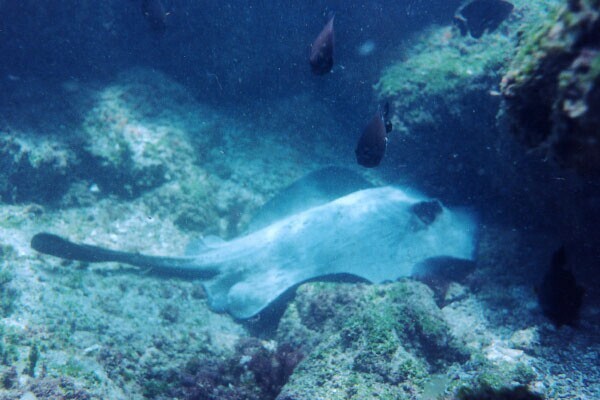 It may be confused with the similar marbled ray, but the latter is dish shaped, whereas the sting ray has a diamond shaped outline. When swimming they glide gracefully along the sea bottom, propelled by undulations of its wings. If you look closely, you can see the sting about halfway along the tail. This picture was taken near Pinnacle Rock, Bartolomé Island.